Recently, IMC Worldwide published an animation Big Blue created for them on their safeguarding commitment and policies. In this post, we briefly explain what safeguarding is, and a little bit about the animation itself. Safeguarding: a term to describe the act of putting measures in place in a professional organisation that protect the people they work with from any kind of exploitation or harm. In late 2018, Secretary of State for International Development Penny Mordaunt demanded an overhaul of UK development safeguarding measures worldwide. UK management consultancy IMC Worldwide is a top-10 DFID supplier responsible for supporting UKaid delivery around the world. That’s why IMC commissioned Big Blue Communications to create a short animation announcing their renewed pledge to safeguarding. The film summarises IMC’s adoption of the safeguarding framework (Prevention, Reporting and Response), how to report a safeguarding violation, and how that report is then handled. IMC offered Big Blue a unique challenge. We had to communicate the story of safeguarding in a way that did not rely on readily identifiable characters or locations. Rather, IMC wanted to tell this story using simple shapes interacting in an empty space. 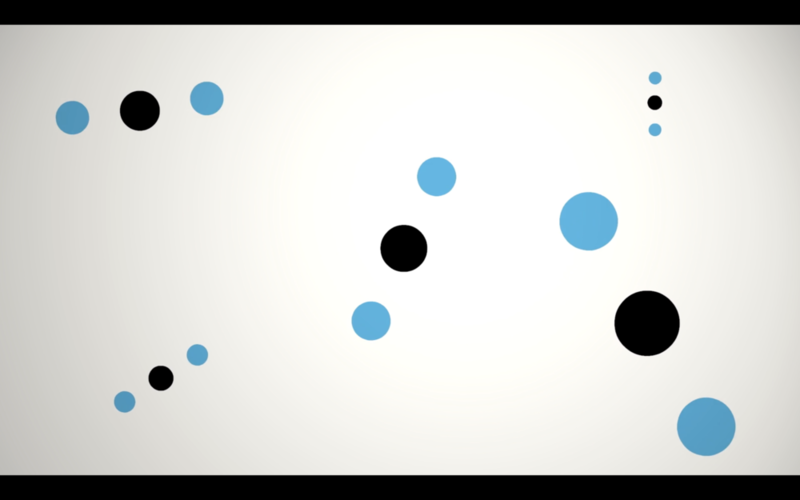 In the film, IMC’s personnel are represented as blue dots, and their stakeholders whose welfare they must protect as black dots. In a short series of sequences, the two groups of dots and a supporting cast of symbols interact, explaining different facets of IMC’s approach to safeguarding. You can read up on IMC Worldwide’s safeguarding activity online at imcworldwide.org/Safeguarding. Be sure to follow IMC on Twitter @IMCWorldwide. We’ve done a great deal with the aid sector to tackle the safeguarding crisis, both in the UK and internationally. We’ll continue to challenge organisations to drive up standards. IMC has a responsibility to protect the people that we engage with from harm. We will do everything we can to make sure the people on our programmes do not take advantage of their positions and are respectful in how they interact with others. To help us to do this we use the safeguarding framework of Prevention, Reporting and Response. We take steps to only employ or contract people who meet our standards of conduct. The people on our programmes and in our offices are aware of their obligations and the consequences of breaching our standards. We work with communities and stakeholders to ensure that there is a clear understanding about how our personnel should behave and what they can do if our personnel do not behave in that way. We have designed simple and accessible methods for reporting any concerns. This might be reporting to a senior member of the local team, reporting to IMC’s Safeguarding Manager in the UK, or via our Independent Whistleblowing Facility. We always look after the confidentiality of those making a report. Our people are trained to receive a report in a safe and secure way. We take every report seriously and make sure that the right people are in place to decide on what to do next. In each case, the people involved will have particular needs that must be considered. We put the needs of survivors first, and every step is taken to protect those involved. Safeguarding is an essential part of how we work at IMC. We are always looking at ways to improve how we work, as well as our safeguarding systems worldwide. If you are a potential partner or client also looking to make a difference, please get in touch. Digital communications in the non-profit environment is demanding. Resources are tight, and expectations are high. This is especially true on donor-funded projects, with short timelines and teammates sometimes working together for the first time, often entirely remotely. You, the comms professional, are trying to maintain calm in a sea of digital noise. At Big Blue, we feel your pain. On international development projects, digital communicators must wear several hats. They manage communities, tell stories, campaign, and respond to insights. To do this, you want to use the power of social, visuals, and online networks, but you struggle for buy-in from funders and team leaders. You know how to help your project communicate faster, wider, and more visually. But you face resistance from teammates and funders who may not yet the value of comms investments. You have powerful systems and workflows, but these are received with varying levels of enthusiasm. In which areas are digital communicators searching for guidance on projects? Areas include the role of communications in digital transformation, how to get visual/animation/video storytelling embedded into campaigns, and how to build online communities. What dominates our discussions with digital communicators? Across cultures and sectors, we hear digital communicators facing similar challenges on international development projects. Here are some top conversations with digital comms professionals in 2018. Digital communicators are connectors and modernisers. The world is moving social, visual and mobile. This means that digital communicators have an increasingly important role to play in the success of development projects, but teammates and funders may not see that yet. Your practices and workflows can make communication faster, cheaper, and safer. Communicators have a vital role in the digital transformation of companies and projects. You can be the energy that pulls projects into the future, but you need to make a strong case for comms. Bring animation, film, visuals, and sound. These lead to more engaged communities, better presentations, shorter proposals, and lower language barriers. Increasingly, comms professionals want to incorporate short social media animations/videos to communicate data. Meanwhile, field staff are turning mobile phones into digital storytelling tools. The right comms targets, indicators, and results are important. Digital communicators are often working on projects with unclear plans and unhelpful indicators. Indicators often focus on incomplete pictures -- ‘number of retweets’ -- instead of meaningful interactions. Instead, comms targets must be closely aligned with overall project objectives. Donors/funders need to care about digital communications. Comms professionals are often disconnected from donor teams. This leads to lack of awareness of comms achievements. Instead, try to connect with donors. Create regular comms reports that are part of the project conversations/meetings/updates. Show how comms supports the project vision. ‘Make it pretty’ is an excellent opportunity. Yes, digital communicators are sometimes asked to make something pretty. Relish it. ‘Make it pretty’ really means ‘Make it stand out’ or ‘Make it impactful’, and you can do that. Your team needs you to be a firm, kind editor. Editing can be challenging. No one thanks editors. But editing is vital. Your team needs editing/approval structures. Seniors and experts need to be OK with edits to overtly technical or unclear content. Make the case for clear, compelling, direct, concise communications. Set the tone, voice, and messaging at the beginning of your project. Digital transformation: Where does a team start? What role do digital communicators play? User experience: How design/tone/message need to be crafted in 2019. Accessibility standards: How do they influence design? Changing audiences: Baby boomers, generation X, generation Z, millenials. Remote working: International development project teams are increasingly remote and digital. How can communicators help teams get the best out of the new working environment? What else are you digital communications experts facing on international development projects? Tweet, email, or fill in our Contact form. A resource-saving tool for project teams that need a starting point for clear, uniform messaging. Targeted primarily at project communications experts on international development projects. Content is important. It influences thoughts, emotions, and actions. Good content makes the world better. At Big Blue, our internal writing style guide helps teammates to create clear, compelling content. This guide governs our writing for reports, stories, website and social content, scripts and even emails. We often work closely with communications experts juggling complex content needs on large international development projects. They fill multiple roles as advisors, editors, and producers, often with project teammates working together for the first time. We are sharing our writing style guide to give those project comms experts a head start and save resources, too. Fact-check. Reputations depend on it. Write to create connections. Stories are about connections with people. Write with emotion. No robot language. Get to the point fast. Reduce adverbs and adjectives. No throw-away statements. Reduce noise in your writing. Each word matters. 1 minute = 150 spoken English words, or 250 read words. Plan accordingly. Short words, sentences, and paragraphs. Break up and condense long sentences. Plain writing travels better across language barriers. Less than 25 words per sentence as per UK government practice. Comprehension drops as sentences become longer. Comprehension is around 10% once sentences are around 43 words. Write with structure. Start with a skeleton of helpful, memorable titles and headings. These give structure. They also attract attention. Up to 80% of online readers may never read more than a title, so make it count. Write several versions of a title before choosing the best. Modern UK English. No archaic language. Proofread. Proofreading is conscientious, caring, and professional. You are in charge of your own proofreading. Use jargon and acronyms with care. They save time for some audiences, but alienate others. Aim for acronym-free/light writing. Words + images = power. Images often communicate faster than words. Use often. Write with collaboration tools like Google Docs or Microsoft Sharepoint. Let your teammates write and edit together at the same time. Avoid version control problems. Use ‘style headings’. These save time, money, and mental health. This is not optional. Teams that use style headings spend less time formatting. Use agreed filenaming conventions. Consider the search terms that teammates may use. Do not use your own filenaming conventions. Put files on the shared drive. This is safer and more helpful than storing on your own device. Store in logical locations for easy searching. Be a kind, critical, supportive editor. ‘Track’ changes when reviewing others’ work so they can see your edits. Be firm in helping teammates adhere to a writing style guide. On Thursday, 30th March 2018, project stakeholders were assembled at the Inclusive Business Conference held at Amari Hotel in Dhaka to discuss financial inclusion for all and Bangladesh’s progress towards achieving the SDGs. At the event, our team was responsible for leading a presentation on access to finance for the nation’s underprivileged people. The presentation was attended by the Chief Guest, Special Guest and Honourable Guest, as well as ministers and business executives. The presentation was opened by the Master of Ceremonies, who introduced the need for MFS to be incorporated into the vision for Digital Bangladesh. Our team then gave a presentation that highlighted the main points of our research. Consumers are using MFS, but small business owners are not doing so to a large extent. Government must take steps to ensure that MFS are taken up by small business owners in order to promote innovation across the country. Why this does not work: Long-winded and not direct. Robot language. No emotion. Focuses on the wrong details. Mis-prioritisation of information slows reading. Does not get to the point fast enough. Throw-away phrases include ‘financial inclusion for all’. Passive voice throughout. Includes alienating acronyms. Last Thursday at the first-ever Inclusive Business Conference in Bangladesh, we presented our research into small business owners’ use of mobile financial services. Overall, the outlook is poor. Citizens are indeed picking up services like bKash and Rocket to transfer small amounts of cash, but small business owners do not see a strong case for incorporating digital services into their operations. In fact, less than 20% of small business owners use digital services for deposits or loan applications. More than 60% of surveyed business owners feel that mobile financial services are less secure than more traditional financial services. This perception of mobile financial services is bad for business and for the country’s development. The government must create a better environment that encourages small business owners to move to digital services if the country wants to compete with others in the region. This is urgent, particularly as Bangladesh is now, according to a recent Global Innovation Index Report, the least innovative country in Asia. Why this works: Short sentences, simple words. Gets to the point. Avoids pomp. Includes hard facts. Offers context. Gives readers a lot to think about. Creates a sense of urgency. Sentences start with helpful ‘linking’ words such as ‘Overall’, and ‘In fact’. Includes helpful hyperlink to report where readers can do more in-depth research. When people think of development, they often think of charities and NGOs. But vital support is also delivered by companies, universities, banks, and think tanks. The Centre for Development Results is a growing London-based association of companies that deliver aid worldwide with the UK government. For a full list of members, check the CDR site. The CDR showcases its members’ projects, organises events to share lessons, and stimulates debate of development sector issues. Each quarter, for instance, it launches publications covering topics such as women working in international development, and aid delivery in conflict states. Its goal is to improve impact, value for money and accountability in its members’ work. 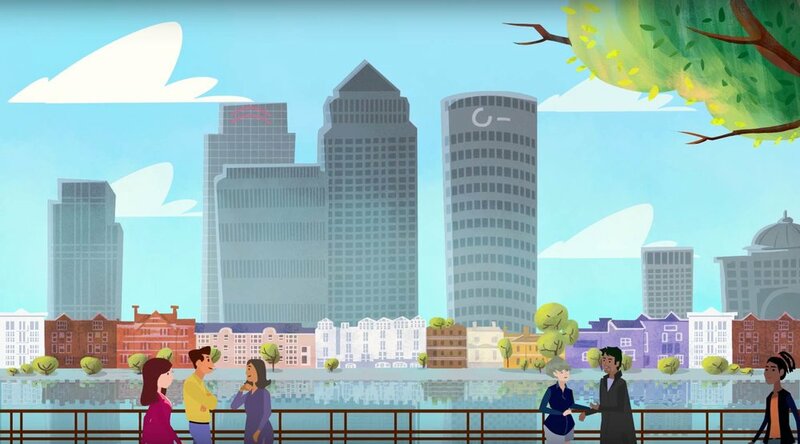 London riverfront: A scene from our animation that tells the CDR story. Warm, upbeat, energetic, and invitational. That’s the the tone of the story, narration, music, and visuals. 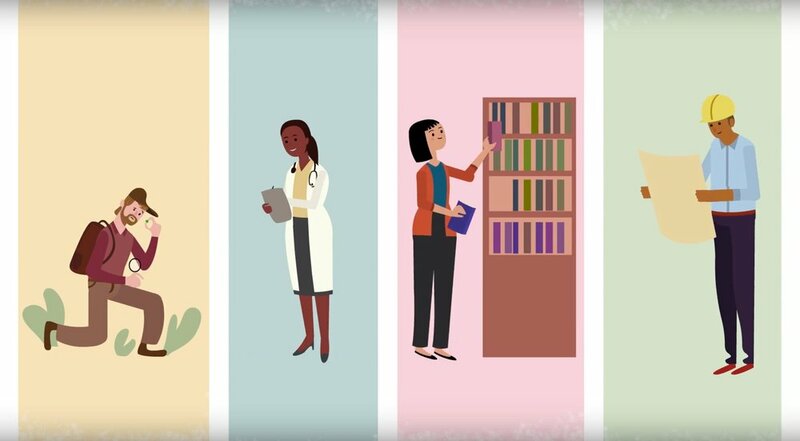 The animation features people from many professional backgrounds each supporting international development in unique ways. Their support encompasses agriculture and industry, health, infrastructure, and aid in emergencies and conflict. That diversity features strongly in the script and visuals. The CDR also brings organisations together to share knowledge and experiences within London. It regularly hosts events and releases publication to create awareness of development sector issues, so we created a connection between audiences and the city, too. And as the film is an invitation for companies join the CDR, it finishes with a clear call to action. It was important that we leave audiences with concepts such as debate, discussion, and online search. Watch the animation, check out the CDR website, read its publications, and join the debate. Do you work in #UKaid or #globaldev and find it challenging to manage work-life balance? Do you ace it? We want to hear from you! Register for our Women Working in Development event with @bdoaccountant. What do you think of when you think of international development? Many people think of NGOs and charities. But it also includes organisations like universities, companies, think tanks and banks. And it includes people like researchers, engineers, and health and education specialists. Based in London, the Centre for Development Results is a growing association of private sector organisations that support the UK’s international development efforts. They respond to crises and conflicts, and they deliver food, water, shelter and healthcare in some of the world’s most challenging environments. They build vital infrastructure such as schools and sanitation systems, and they support countries and communities to grow and stand on their own two feet. And they are CDR members because they share a desire to improve the impact of that work. Here at the CDR, we explore our members’ contributions to international development, and we showcase their life-changing work. We create spaces to exchange lessons. We stimulate debate on how to improve standards in the sector. And overall, our goal is to help the UK government and our members change lives. And now, we are expanding the CDR network to bring more passionate voices to the discussion. So, what do you think of when you think of international development? We want to know. Find us online, read our publications, and join the discussion. And together, let’s achieve better development results. 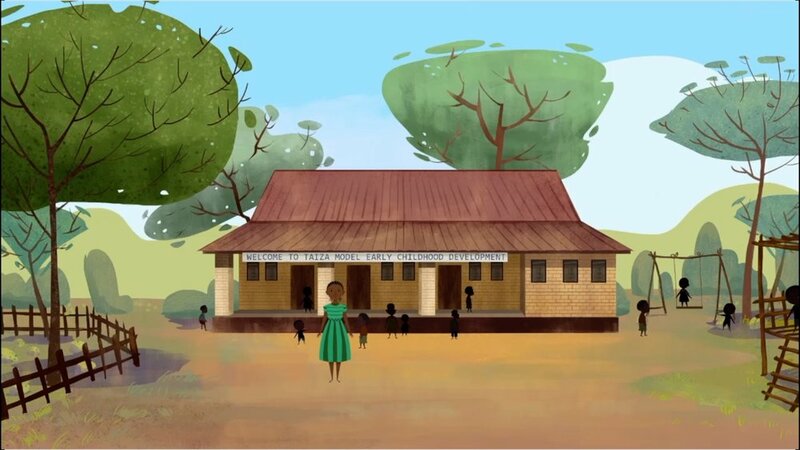 Recently, the Malawi Oilseeds Sector Transformation programme published an animation summarising the project’s successes. The film is a take on classic whiteboard explainer videos (the kind where you see a hand drawing the images with a marker) and also includes digital art and motion graphics. Sajid recently joined a brilliant 3-day seminar of 60+ researchers, funders and policymakers brought together to highlight opportunities and challenges of interdisciplinary research in meeting Sustainable Development Goals. The end of the year approaches, so we have listed nine books that communicators in your team need to pick up in 2018. No matter what communicator role you fill, there is something on this list for you. Saad Chowdhury is Head of Audio at Big Blue, bringing together the voices, music and sounds that communicate the messages and emotions of our film projects. 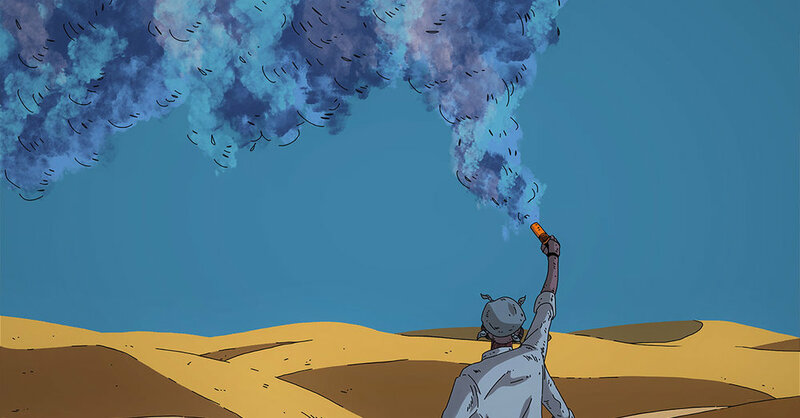 Check out Saad's post on the Big Blue Communications blog to read how sound helps stories achieve impact. For some organisations, the annual report is the largest storytelling assignment of the year. Whoever your audience, and whatever design format you choose (make it visual! ), these tips will help your team produce a memorable story. We now live in a beautiful online world. How does your team fit in? We now live in a beautiful online world, where design is improving by the day. Great websites, photography, video, and design tools were once expensive, but that is changing fast.